It’s March, everybody, and you know what that means: brackets! This year, I’m honored to follow in the footsteps of Ken Tucker, Alan Sepinwall, and Rob Sheffield as guest commentator, cheerleader, and all-around raconteur for Hulu’s annual “Best In Show” tournament, which you can see here and give your love on Twitter with the #HuluSweet16 hashtag, if you are so inclined. Hulu narrowed a list of every show on TV to a sweet 16, and then I came in and asked if they’d thought about adding My Little Pony Friendship Is Magic before they stared me down in abject horror. We think you’re going to love arguing about and talking about and pitting these 16 shows against each other, and we’ve even included some shows I’m not that fond of (but you might be) for variety’s sake. Click on the link above and vote, or if you want to know why I voted the way I did, keep reading. We’ll do this every one of the four weeks for which this tournament will run! First, a quick note on methodology, because I am even an intense nerd at online brackets. I first had to determine what I was voting for when pitting these shows against each other, and I decided, completely arbitrarily, that my eligibility period would be April 2013 through March 2014. This meant, for instance, that enough really great New Girl episodes from season two got in to push it past Veep, while it also meant that quite a few terrible episodes from Community’s fourth season found their way into eligibility, which caused that show to fall. This is not a foolproof system, and I don’t know that it will work all of the time going forward. If you don’t want to follow my eligibility window for your own voting, please don’t. I just like to overthink things, in case you couldn’t tell. 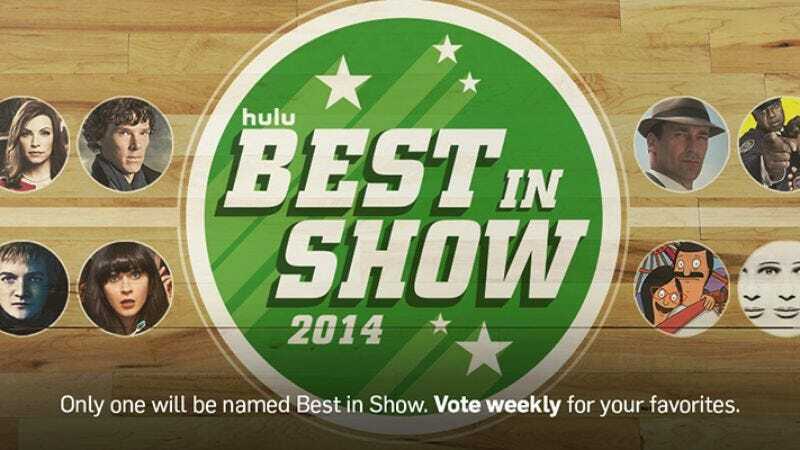 Join me here again next week, when you’ve voted for all of the shows I did not!